A University of Central Florida student is taking the lead on propelling his professor’s energy-storage invention into the marketplace and, with the help of several of the university’s innovation support programs, is getting noticed. Capacitech Energy LLC, led by CEO and UCF electrical engineering junior Joe Sleppy and co-founder nanoscience Professor Jayan Thomas, has licensed Thomas’ invention to design easily customizable capacitors necessary for electronic circuits and market them to manufacturers. Both credit UCF’s entrepreneurial support services – specifically the Office of Research and Commercialization’s I-Corps program and the College of Business’s Center for Entrepreneurial Leadership — with helping them grow the business. “The university and the I-Corps program have given us a place and time to explore different business models to ensure we had a feasible path forward,” Sleppy said. 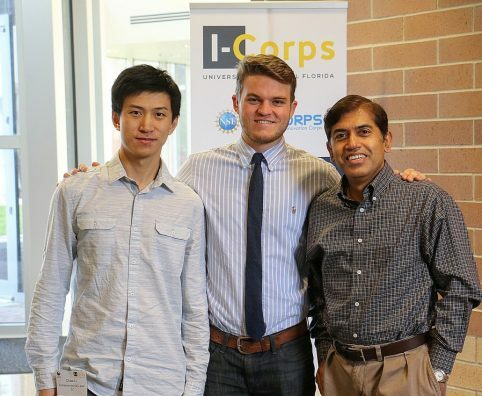 UCF is one of 37 universities nationwide selected by the National Science Foundation as an I-Corps site in 2015. It is one of NSF’s signature programs to foster entrepreneurship that will lead to the commercialization of research. Thomas developed a technique for manufacturing a copper wire-based capacitor that holds the potential to help manufacturers significantly reduce the cost of producing electronic devices. Because a typical electronic device can require many different size capacitors, each performing important tasks such as power conditioning by reducing voltage spikes, manufacturers will typically stock different sizes of capacitors to be certain they have the size required for each role a capacitor plays. Since Capacitech is enmeshing capacitor functions in a wire, an electronics manufacturer could buy a spool of the cable capacitor and cut the wire at customized lengths to meet their needs, which reduces unit costs and inventory cost. They found multiple potential uses for the cable, including replacing capacitor banks on cell towers to reduce the rent paid on the tower, using the cables in transmission lines that are capable of storing solar energy in homes and offices, sewing clothes with an energy-absorbing thread that would allow a cell phone to be charged in a suit pocket, and manufacturing smaller and lighter electronic devices. Capacitech won the UCF College of Business Joust award in 2016 and Thomas’ technology has been written about in Nature. The technology was also recognized with an Oscar of Innovation at the 2015 R&D 100 Awards and was named a finalist at the 2014 World Technology Network Awards. The company has applied to UCF’s Business Incubation Program and is working with a potential customer to raise seed funding. The company is also a finalist for the Orlando-based FireSpring fund, which invests in promising technology companies in Central Florida.